← First postcard delivery from volunteer Jonathan! 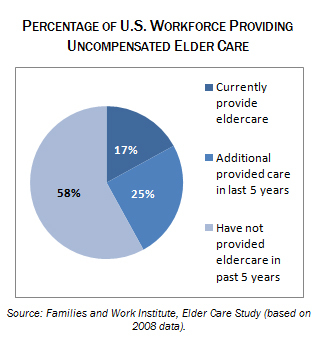 A comprehensive study based on 2008 data found that 17% of the American workforce at that time was providing uncompensated care for an elderly person, and 42% had during the previous 5 years. Men and women were equally likely to be providing such care. Nearly half of workers believe they will be responsible for eldercare in the next 5 years. Employed family caregivers still spent on average 45 hours per week at their paid job – as much time as those without such responsibilities. Compounding the time crunch, 46% of the women and 40% of the men also had children under 18 living at home. Based on those figures, approximately 85,000 members of the Seattle-based workforce currently care for an elderly person, and 245,000 will during the next five years. Caring for aging parents is not the only issue. With the workforce rapidly aging, more spouses and domestic partners – and workers themselves – are at risk of developing serious health problems. Between 1991 and 2009 the percentage of workers in King County over the age of 45 increased from 25% to 41%. This entry was posted in Family values, Paid sick days, Policy and research and tagged elder care, Paid sick days, paid sick leave. Bookmark the permalink.